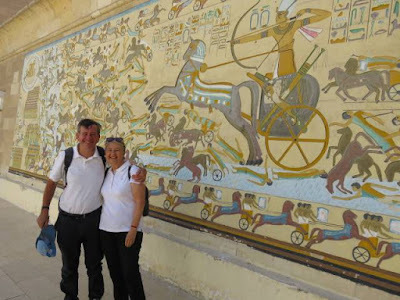 The Travelling Lindfields: The 9 & 1/2 best places to visit in Cairo - and one to avoid! else), then you waited some more - in a jet-jam of aircraft for your turn to take off. You spent a night or two in transit - Singapore perhaps, or somewhere previously unheard of in the Middle East. You staggered, exhausted through arrivals, customs, quarantine and fought your way to the head of the taxi queue - where you paid triple the price because you are a tourist. You are jet-lagged, disoriented and beyond tired. But hey you are in Egypt - Cairo to be precise. This is what you came to see, why you suffered through all those long hours of travel - entire days of your life you will never get back. There is no way you are going to just hang around the hotel while your body clock catches up with the time zone changes. You're going out there to see things. BUT - Cairo is a living, writhing mass of 20 million people. It is hot, it is polluted and the roads are so congested it can take several lifetimes just to make it to the end of the street. You need a plan! David and I have tackled Cairo (twice, four times if you count multiple visits in a single trip to Egypt) and won. Work down our list of places to visit in Cairo more or less in the order we have included them and you too can say you have 'been there, done that and lived to tell the tale'. Good luck - and drop us a line when you get back to tell us how you went! Would I recommend you head out to the pyramids on your first day? Yes - and no. 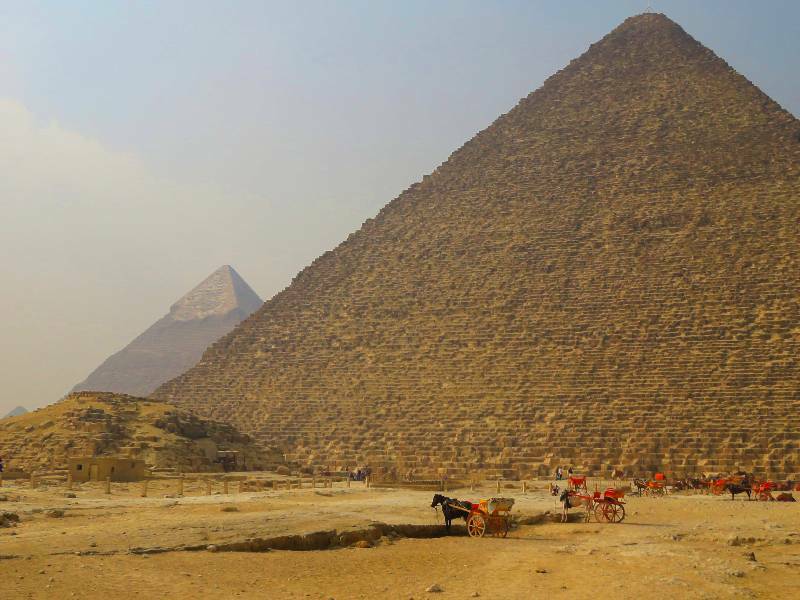 Seeing the pyramids is a full day activity, half a day at the absolute minimum. The wow factor is huge but the pyramids are on the edge of the desert. They are hot and tiring, you don't want to numb the experience by being semi-comatose with exhaustion before you start. On the other hand there is a lot to be said for seeing the pyramids twice, once to get a feeling for the place and a second time to enjoy them without feeling hassled. If you have time to go twice then hit them on Day 1, if not, maybe wait a day or two until your jet-lag levels have drop below critical. Whatever you decide make sure you read my 'Complete guide to visiting the Pyramids of Giza and tips to avoid the scams' before you go. 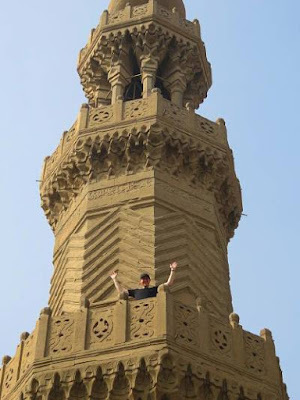 If your accommodation is in central Cairo this is a great first day activity. It is easy to get to, relatively compact and, best of all, air-conditioned. 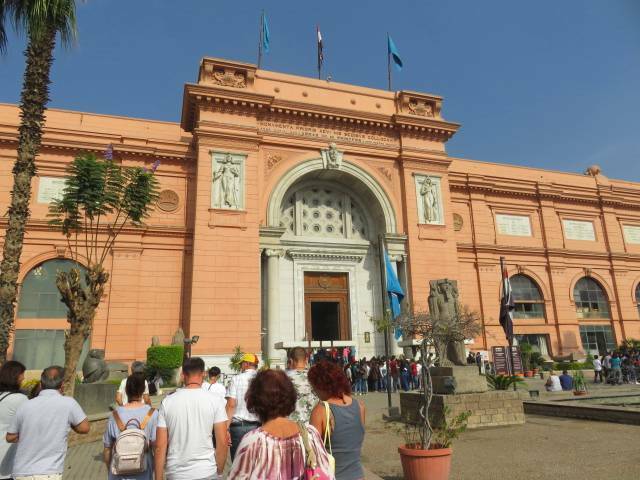 The Egyptian Museum is still in its original location in Cairo. The new Grand Egyptian Museum being built at Giza near the pyramids is still under construction. Originally planned to open in 2013 it shows no sign of completion as yet. The latest set back, a fire in April 2018, further delayed the projected opening. I spent many internet hours trying to figure out whether in December 2018, when we last visited Cairo, we would fall between the cracks. Although the old Egyptian Museum is to remain a museum, many of the items in its collection will be moved to the new Grand Egyptian Museum. I did not want to arrive only to discover that Tutankhamen's treasures were in transit. There is surprisingly little information on when the treasures will be moved. However I need not have worried. As far as I could see, with the possible exception of his chariot, they are all still safely on exhibit in the original museum. 300 EGP (23 AUD/17 USD) for an inclusive entry and Mummies Room ticket. Evening hours - 5.30 pm to 9 pm Sunday and Thursday with the last ticket sold at 8 pm. Set aside at least half a day. There is a lot to see. Your taxi or uber can't deliver you right to the entrance. The area between the Nile Corniche and Meret Basha is a pedestrian zone with security checkpoints at either end. Chances are you will be dropped in Meret Basha. Just head toward the big salmon coloured building (see my photo above). You can't miss it. If you want to take your camera inside you must buy a photography ticket. There is a cloak room where you can leave it otherwise. Phone cameras didn't seem to be an issue, although personally I bought the photography ticket so I can't promise you won't be asked to produce a ticket if you start taking photos with your phone. All photography is prohibited in the Royal Mummies Rooms and Tutankhamen's Mask Room. Pay the extra for the Royal Mummies Room - the mummies are a whole lot of long dead people wrapped in bandages but there is something strangely compelling about them. There are a couple of mummies you can see without a ticket if you want. Go upstairs to Room 13 where you will see the mummies of Yuya and Thuya, the grandparents or great-grandparents or something, of Tutankhamen.. The Tutankhamen Galleries are upstairs on the first floor. Head there first and work your way back down. Do not miss Tutankhamen's Mask (Room 3). The museum cafe is long closed. Head next door for lunch at the Ritz Carlton Hotel. It is over-priced and the service is slow but it is otherwise quite pleasant. If you want to eat outside in the garden you must take the buffet option. 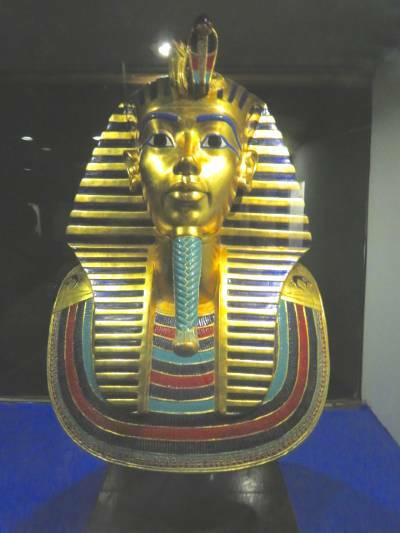 Tutankhamen's Mask - this is a copy. Visitors are not allowed to photograph the original. Islamic Cairo is a place to dig deep into old Cairo. More traditional than other parts of town this is a great place to wander, get lost, find yourself again and soak in the atmosphere. Many of the streets are either too narrow for cars or at least too narrow for much traffic and almost every corner has a mosque, minaret or tower. 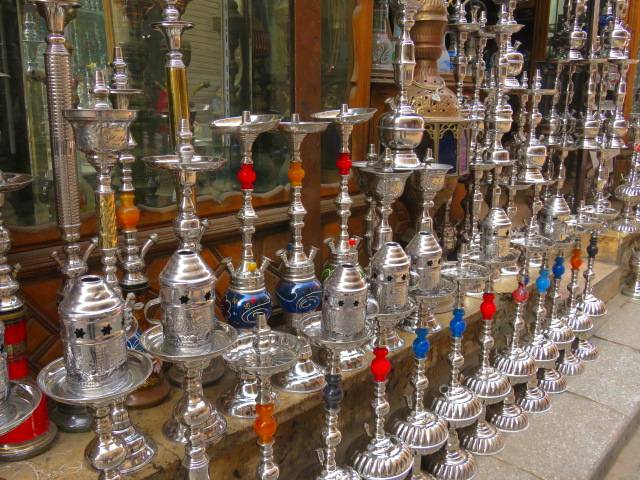 Don't miss Darb Al Asfar alley and its medieval atmosphere. Look for it off Sharia Al Muizz Li Din Allah which runs through Islamic Cairo from north to south. As you enter Darb Al Asfar keep an eye out on your left for Beit El Suhaymi, a mansion built and extended from 1648 to 1796. For 80 EGP (6 AUD/4 USD) you can go inside and explore, getting an idea of what traditional life was like for its inhabitants, especially the women in their screened off apartments overlooking the courtyard. When the inevitable 'guide' approaches you to take a tour, say yes and ask to see the 'blue room'. It is lovely and locked to those without a guide. Be prepared to offer baksheesh (a tip) for the service. Don't miss Bab Zawayla a medieval gate set in the remains of part of Islamic Cairo's defensive walls. Climb to the top of one of the twin minarets for a stunning birds-eye view of the old city. The very top is not for the faint-hearted. Andrew, our son, did the climb while we waited below on the first level - someone had to take the photo. Entry to the towers is 40 EGP. Don't get conned into paying to climb the mosque next for double or triple that amount. To get to Bab Zawayla head south along Al Motaz Ldin Allah from the main thoroughfare of Nafak Al Azhar. Andrew looking down from one of the Bub Zawayla towers. Within the geographical area of Islamic Cairo Khan Al Kahlili is a series of chaotic passageways, lanes and narrow streets with market vendors of every description. The vendors are grouped by what they sell so you will find, for example, rows of shoe stalls, then material stalls, then camera stalls, then hat stalls. Try to get away from the souvenir and trinket sellers. There is so much more to Khan Al Kahlili than just tourist shops. Watch your wallet especially in the narrow, crowded lanes. Coptic Christians make up about 10% of the population of Egypt. 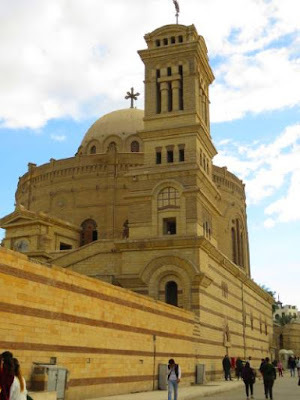 Coptic Cairo within the boundaries of the ancient Fortress of Babylon has a collection of Coptic churches and the seemingly never ending Coptic Museum. Like Mary Poppins' carpet bag and the quidditch tents in Harry Potter, the museum is far larger on the inside than its external dimensions should reasonably allow. Moreover once inside you must keep going forward or find yourself hopelessly lost in a maze of rooms and religious artifacts. Allow at least a week to see it and equip yourself with emergency survival provisions and a sleeping bag. Don't miss the Hanging Church just south of the Coptic Museum. As you enter Coptic Cairo from the north watch out for a set of steps on your left leading down. Take them - they lead to a maze of narrow streets and alleyways housing, among other things, the Church of St Sergius & Bacchus. The church is built on a site where Mary, Joseph and the infant Jesus were said to have stayed after fleeing King Herod. Originally constructed as a fortress against the crusaders in 1176 The Citadel (Salah El Din Citadel) was built by Saladin, the only Muslim leader during the crusader era who most Europeans have heard of. He must have had in mind the real estate maxim 'location, location, location' because The Citadel and the mosques and palaces comprised within it dominate the skyline. The Mosque of Mohammed Ali was one of the few mosques in Cairo I felt comfortable entering. 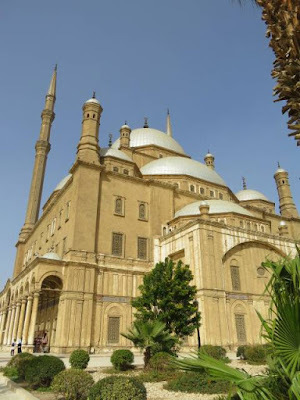 In theory most of Cairo's mosques are open to the public but you tend to feel a lot like a fish out of water inside them. The Mosque of Mohammed Ali attracts enough tourists to feel welcoming to even the most entrenched non-believer. Catch a taxi or uber to get to The Citadel. Perched high on a hill it is not easy to walk to. Don't go on a Friday, the Muslim holy day, when the mosque is closed during prayers. At the very southern tip of Roda Island, the Nilometer was an ancient device used to measure the flood waters of the Nile. There are many nilometers scattered around Egypt but this is the best we saw. If you have a good head for heights you can climb right down into it - good luck though because there is no hand rail. You need a ticket to enter the area but it was only a few Egyptian Pounds. Andrew at the bottom of the Nilometer. David and I stayed at the top - someone had to take the photo! I have put the Step Pyramid toward the end of my list because it a good hour and a half by car from central Cairo, more if you hit traffic, but if you have the time it is well worth the journey. Not only do you get to see the world's oldest pyramid but you can visit the Tomb of Mehu, Egypt's newly opened tomb. Make sure you read my post on A guide to visiting the Tomb of Mehu before you go because it can be tricky to find. Forget Memphis, the ancient capital of Egypt - it is closed. There is however an open air museum of statutes which is well worth calling in at on your way back from the Step Pyramid. The best is the massive statute of Ramses II. Now recumbent, the limestone statute once stood 10 metres (33 feet) high. Ramses II ruled Egypt for 66 years and fathered 90 children - you have to admire him for that if nothing else. 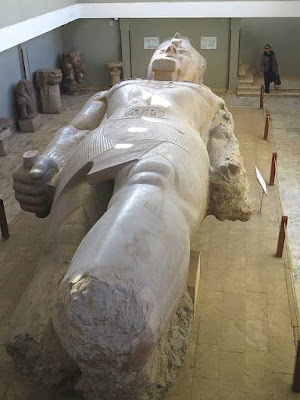 If building gigantic statutes of yourself was a ticket to the after-life then Ramses II definitely made it, you will find his likeness all over Egypt - always in gargantuan proportions. 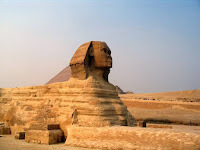 Memphis is 31 kms (19 miles) from Cairo, not far from Saqqara. 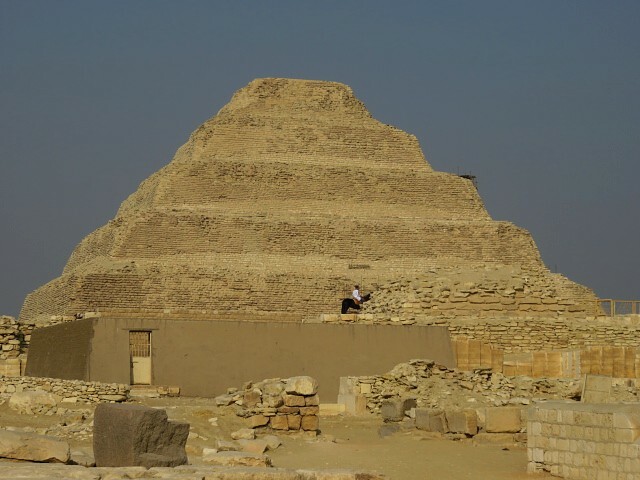 It is quite quick to see and easily combined with a day trip to the Bent Pyramid and Tomb of Mehu. Honestly, I don't know how we got talked into this. The otherwise very helpful concierge at our hotel more or less forced us to buy the tickets. I can only think he must have received a commission. If you have children with you, you'll probably love it - it is a living museum with actors showing how ancient Egyptians lived their daily lives. The worst part is, like the Coptic Museum, once you start you are trapped. Everything is done by guided tour so unless you plan on being rude you must stick it out to the end. Don't get me wrong, it was kind of fun, but I kept thinking how many other things we could have done with the time. I have left Cairo Tower to the end because the ever-present pollution makes a trip up the tower to see the view a bit pointless. Unless you are a collector of tall buildings, or something, I would give it the miss - it isn't even that tall. 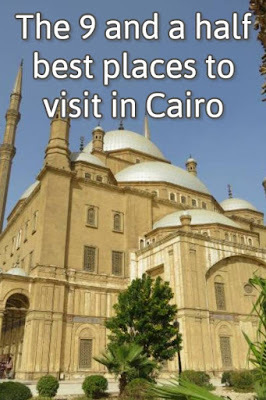 I hope you get to visit Cairo one day and when you do these tips are useful. If you would like to follow our travels, enter your email address in the 'Never miss a post: Follow by email' box in the right hand sidebar just below our profile picture. If you found this post interesting, fun or useful please share it with friends, family or the world! Thank you for the comprehensive post. I've read other posts that dissuade a person from visiting the pyramids at all so it's great to read a post that not only makes it sound worthwhile but manageable. 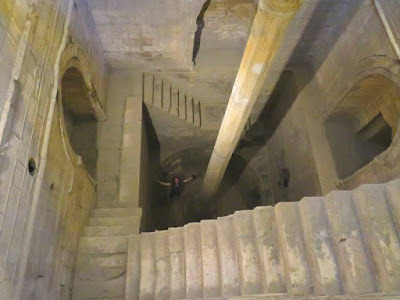 The Nilometer looks beyond my capabilities ( yikes!) but the itinerary sounds fascinating and doable. The pyramids are great. I can't believe anyone would go to Cairo and not visit them. You can stand at the top of the Nilometer and look down and it is still worthwhile. Having our 26 year old son with us was not only great fun but it meant we could climb down vicariously by watching him do it. I was up for the challenge but David is scared of heights. He got about four steps down and had a mild panic attack nearly knocking me off the top step in his haste to withdraw. After that I lost my nerve - lol. Coptic Cairo looks neat Lyn. Before I blogged, I worked with 60 plus Coptic Christian Egyptians at a shipping terminal. I learned about their customs, including celebrating Christmas in January. Neat stuff. Quite a big Coptic community in Northern New Jersey. I didn't know Coptic Christians celebrated Christmas in January. We had a local guide show us around a beautiful Coptic church in Aswan and she probably mentioned it but she had a heavy cold and all I could think of was - I hope we don't catch her cold! I was wondering how the progress of the new Muserum in Cairo was coming - thanks for the update. And the other suggestions as well. Sometimes it’s more important to know where NOT to go! It was surprising how hard it was to find up-to-date information on the new Egyptian Museum and especially on when the main exhibits will be moved. We didn't know for sure that we would be able to see Tutankhamen's Treasures until we were standing in front of them. Thanks for this comprehensive list. We visited Cairo several years ago and didn't have enough time to see it all. Essentials are the Egypt Museum and Coptic sites. There's so much more than the Muslim culture there, although the Mosque of Muhammad Ali is definitely worth the time. Cairo is a great city but its size and traffic mean you have to have an idea of what you want to do, otherwise you will find it really difficult. We have been there a few times now and there is still much we haven't seen. I hope I remember that I saved this very useful post on my Africa Pinterest board. Maybe I need to start a Middle East board. I'm sure the recent bombing of a tourist bus on its way to Giza has done nothing to help Egyptian tourism, but I still hope to visit there some day. The bombing of the tourist bus is very sad. I had been telling anyone who would listen that now was the time to visit Egypt before it gets crowded again but I am tempering that a bit since the bombing. Great information. Egypt is at the top of my travel list as soon as I can convince my husband that it is safe. We never once felt unsafe but that doesn't mean you can't get unlucky and be in the wrong place at the wrong time. Thank you and feel free to comment any time. Hi Lyn: I've always had a keen interest in Egypt, so perhaps someday I will make it to Cairo. I have definitely heard about the pollution being a factor, though. Hi Doreen. Many thanks for your comment - sorry you could only get it to go through by becoming anonymous. There must be a bad line between my blog and yours - or something. Great post! We'd love to visit both Coptic and Islamic Cairo. 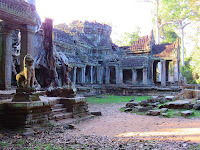 The history and culture of each must be fascinating! I think we'd really enjoy Khan Al Kahlili, too. We love places like that! For now, Cairo remains on our bucket list, but we'll get there eventually! When you do get there I hope you love it as much as we did. Perhaps we were just unlucky. The pollution was thick on all the days we were there. Yes, I've gone up plenty of the tallest tower / building / other in the . That doesn't stop me from going. I guess I'm just being a tourist. We have been up a few. The best by far was Taipei 101 because there is no high rise around it. Cairo Tower isn't all that high and we were staying on a high floor at the Conrad so we had a pretty good view without the tower. We also got unlucky with pollution - or maybe that's normal in Cairo.